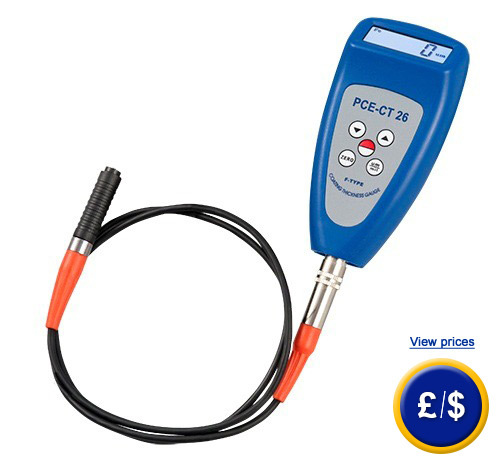 The PCE-CT26 thickness gauge is used to detect the coating thickness of paint on metals, such as iron in the automotive sector. This thickness gauge is suitable to detect damages to car bodies in order to establish if the car has been involved in an accident and the resulting value of the car in the used car market. 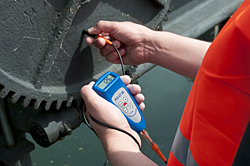 The combination of our thickness gauge with an external sensor is also suited for indoor measurements. It is very easy to use: simply turn on the device, place the sensor on top of the surface that has to be measured and read the measurement value on the display. 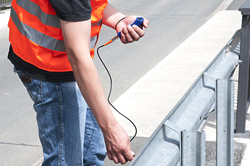 The thickness gauge is suitable to detect damages to a car or if it has been painted again. This clarifies, at the time of purchase, if the price of the car is appropriate, to ensure that a fair price can be negotiated and the true condition of the car is known. 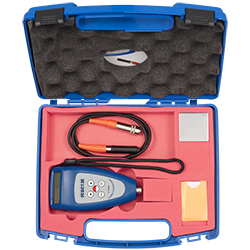 This link shows every thickness gauge we have available to suit your needs. 0 to 50°C; <80% r.h.
Use of the PCE-CT 26 Thickness Gauge measurement on a gear.